Welcome to a new day at the Wayne Oates Institute. Our new online learning experience is live and ready for you to see! Navigate over to Oates.org and see the improved design and user experience for our online learning community. Be sure to visit the “How to Use This Site” link at the very top of the home page to see two videos – one a tour of the main website, the other a tour of the courses for those users who have memberships and have joined us for continuing education credits and online learning. If you are a current member, to take a course or dive into the forum discussions, you will be prompted to reset your password. Be sure to choose something unique but one you will remember! If you are not a current member, you are certainly invited to become one. Our membership programs come at a variety of price levels to suit any budget. We are excited to open the new site with April’s course offering — two content-rich experiences led by phenomenal facilitators some of you may be familiar with. The Power to Bless, a peer-dialogue-driven course focused on Dr. Myron Madden’s book of the same name, will be lead by Gail Henson. 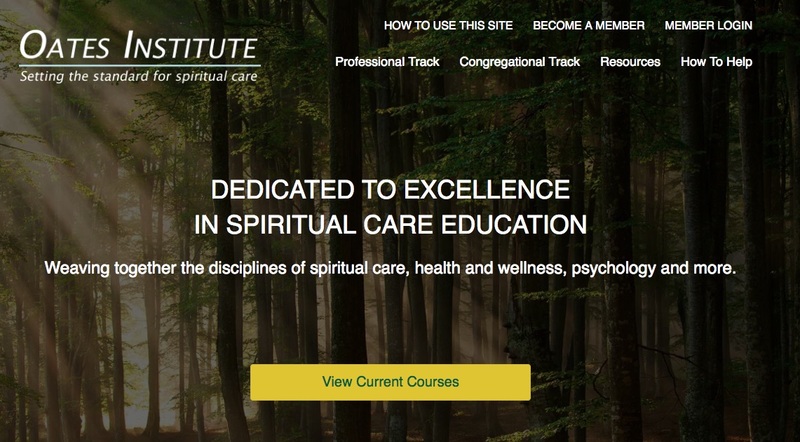 The other April course, Integrating Spirituality and Healthcare, will be led by Carl Aiken. Our new website was the byproduct of an Oates Institute collaboration with digital marketing consultant Jason Falls and Sarah Kuglin of Redwood Valley Tech Solutions. We are very thankful for their contributions to the Institute as part of this project. ← Help Us Improve! Fill Out Our User Survey!